Armstrong Mountain is the legendary site of the Mount Carbon Stone Walls. 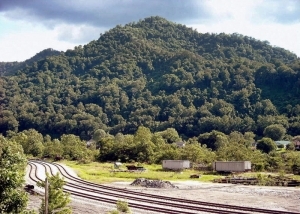 Armstrong Mountain rises steeply from the southern banks of the Kanawha River in Fayette County to an elevation of 2,300 feet. Ancient stone walls raised near its summit, built by prehistoric inhabitants, have led to Armstrong Mountain’s widespread fame. The origin of the walls remains unexplained. Armstrong Mountain is part of the range of the Cumberland Mountains and like other mountains in the range is precipitous with steep flanks and a narrow summit.